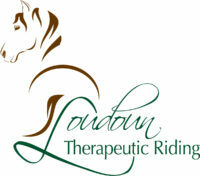 In addition to riding lessons, Loudoun Therapeutic Riding offers a carriage and cart driving program for those participants who cannot, or choose not to sit, astride a horse, yet can still benefit from the interaction with the horse and the equine activity. This program develops communication skills, improves gross and fine motor skills, builds self-confidence, self-awareness, trust, and encourages students to form positive relationships in a socially and sensory rich environment. 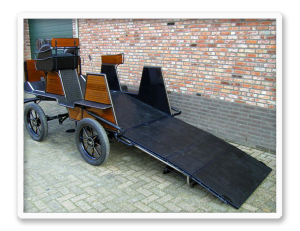 The adaptive carriage was custom built in Holland in 2009 to be wheelchair accessible. It’s a “one-of-a-kind” in the United States making it especially valuable. This unique carriage allows us to provide quality services to individuals needing convenient and safe access the carriage. 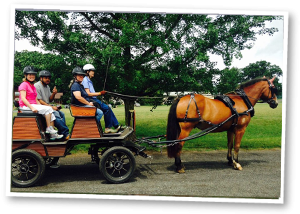 Thanks to the generosity of individuals in the carriage driving community, who raised the needed funds for its purchase, it was donated to LTR in January of 2013. 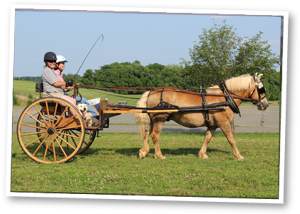 Contact us if you are interested in our carriage or cart driving program.